In search of a garden with a difference? 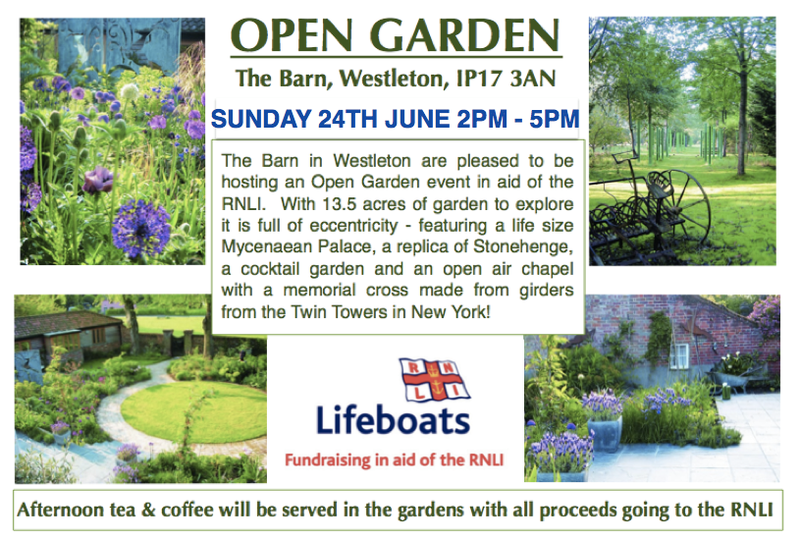 On Sunday 24th June the gardens of The Barn, Westleton, IP17 3AN will be opened to the public in aid of the RNLI. The 13.5 acre garden to the rear of The Barn is the amazing creation of Amédée Turner over a period of 50 years. It is a garden full of eccentricity including a life-size Mycenaean Palace, a replica of the original Stonehenge, the Blue Stone Circle – made from lift doors from a former ICI building, earth mounds covered in oxeye daisies, a cocktail garden and an open air chapel with a memorial cross made from girders from the Twin Towers in New York. Want to know why?, then come and find out! This is a garden like no other. There are no formal beds and borders but plenty of areas and ideas to explore and delight! This entry was posted in News Items on June 20, 2018 by admin.